If you have ever seen leaves on bushes and trees that become skeletonised or transparent with just their veins remaining, this tends to be the work of Sawfly larvae, which eat through the tissue of the leaf until it has almost completely disappeared. At least 400 different species of sawfly have been recorded on plants in Britain. Two or three adult generations may develop during the growing season with the third generation overwintering as pupae that emerge in the spring. This is a "Green Sawfly", Rhogogaster viridis, a common species found on woodland rides, hedgerows and scrub, often on flowers, during the summer months throughout the UK. I found this little guy on the nettles surrounding the allotments in Holmbury St.Mary, England - of all the places I visit and potter this has 3x as many insect types as the rest put together! Sawflies are related to wasps and bees. These primitive wasps are not flies (Diptera), because they have two pairs of wings; flies have one. Their name is derived from the saw-like ovipositor the adult female uses to lay eggs. Adult sawflies are inconspicuous wasp-like insects that cannot sting and cannot eat! 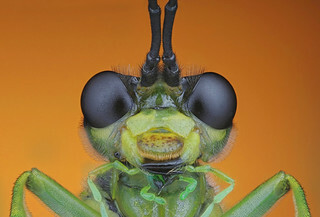 In fact they are one of the few insects in the wasp family that feed on plants; The adult resembles a fly or a wasp but without the constricted waist. The larval or immature stage of sawflies are plant feeders and look like hairless caterpillars and can often be seen around the edges of the leaves and most curl up into an S-shape when disturbed. Larvae will also bore into developing fruits causing them to become scarred and exude sticky liquid. Technical: this only took 8 hrs or so so I must be getting faster, yay! BG output onto SmallHD via HDMI matrix used as background; rear curtain sync .8s exposures; 213 photos into 27 sub stacks, retouched from Dmap composite, finished off with CS4, NoiseNinja & Topaz Detail. Step size of 30μm, polystyrene chip cone diffuser. Resized to reduce noise. Componon 35 f/4 reversed on flat bellows so about 1:1; 3 flashes @1/32 perpendicular @2,6 &10 o clock. Focus Stacking, Focus Stack Preparation, Shooting A Stack, Stack Processing, Stack Post Processing, Schneider Kreuznach Componon 28 mm f/4, Schneider Kreuznach Componon 35 mm f/4, Schneider Kreuznach Componon 80 mm f/4, Nikon El-Nikkor 50 mm f/2.8N, Reject Enlarger Lenses, JML Optical 21 mm f/3.5, 20 mm Microfilm f/2.8, Anybrand MP-E 65 Macro Lens, Manual, TTL, Rear Curtain Sync, Extreme Macro Backgrounds, Single Colour Background, The Gradient Background, Adjustable Flash Shoe Mounts, Extension Tubes, Eyepiece, Field Monitor, Flash Bracket, Focusing Helicoid, Holding Tools, Lens Adapters, M42 Iris, Macro Tripod, Making A Macro Beanbag.